Remember when I made a baseball quilt for my son's really great t-ball coach earlier this year? 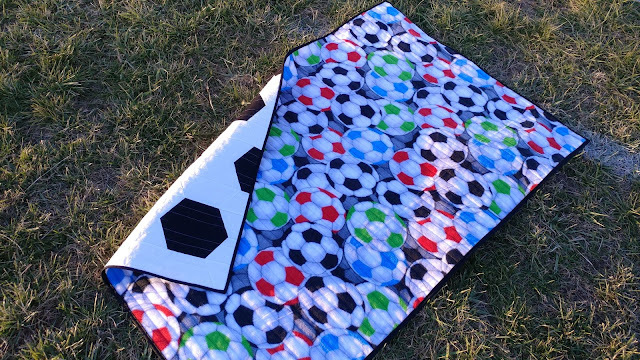 Well, we just finished up the soccer season, and I couldn't resist making a soccer quilt for the coach! 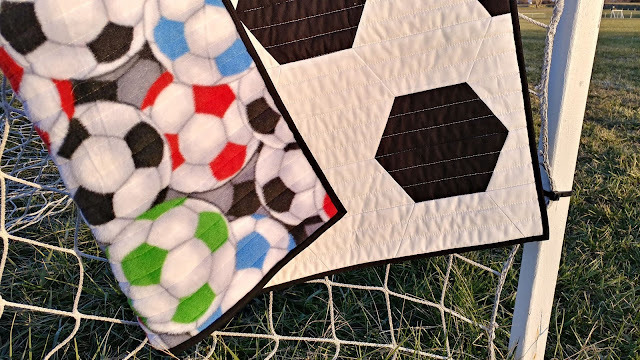 I really tried resisting the urge to make a soccer quilt. I mean, pentagons? 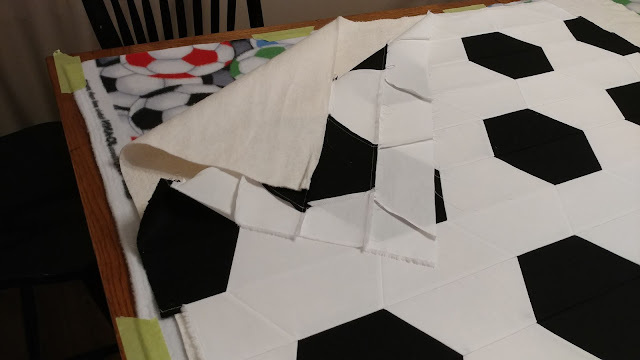 Not the easiest quilty shape! But then one day I was scrolling through Pinterest, and saw a soccer quilt made with hexagons! 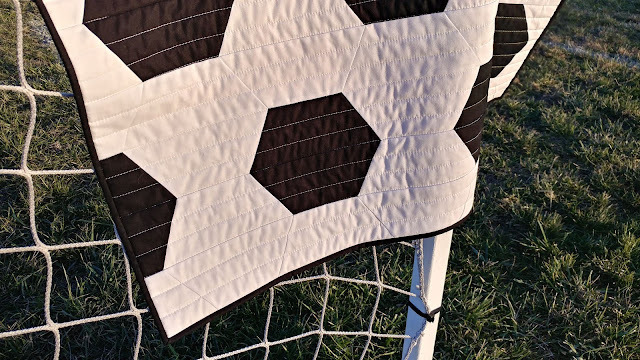 It still looked soccer-ish, but was much more quilt friendly! After finding enough yardage of Kona Black in my stash, I knew resistance was futile. The quilt would have to happen! I cut 3 1/2" wide strips, then subcut those into half hexagons that measured 8" on the longest side and had 60 degree angles on either end. I made a rough drawing of what I had in mind, so I cut about how many I thought I would need. 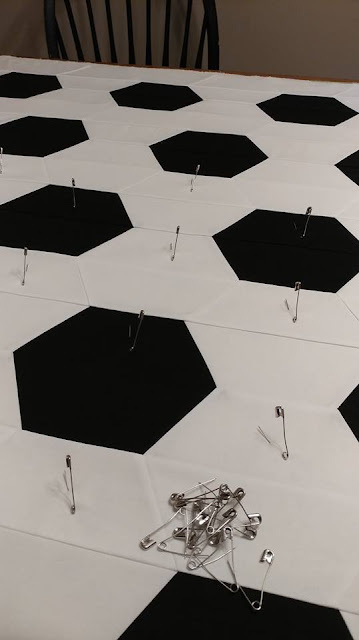 After laying out the quilt pieces to get a feel for how long each row needed to be, I started sewing the half hexagons into rows. 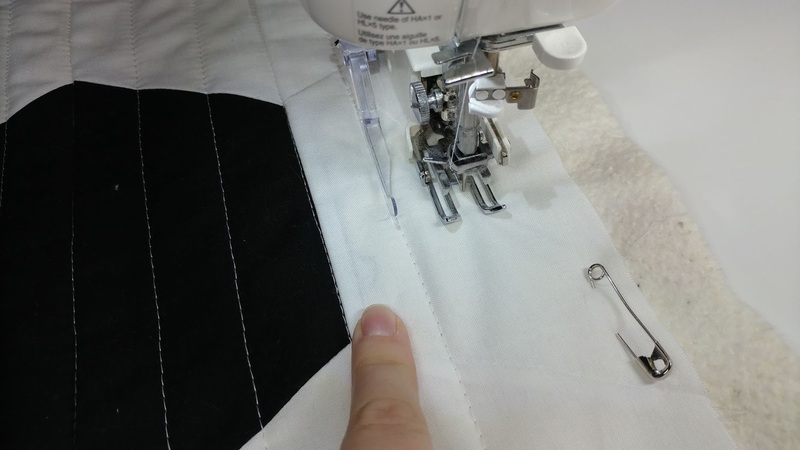 I used Aurifil 50wt thread in #2024 White for all the piecing and quilting. 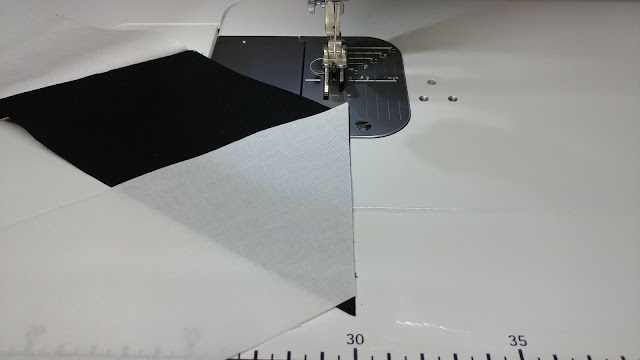 When sewing half hexagons (or triangles), you offset the pieces just a bit so that the needle will stitch exactly where the two fabric pieces cross. This little trick is how to get "perfectly" straight rows! 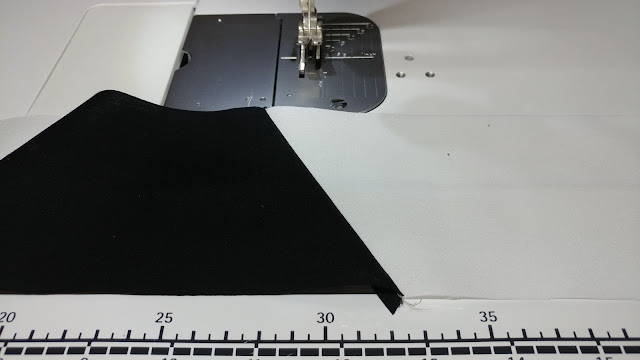 I originally was going to press all the seams towards the black fabric, but then decided that nesting the seams was much more important to me. So I pressed the seams in the odd numbered rows to the left and even numbered rows to the right. 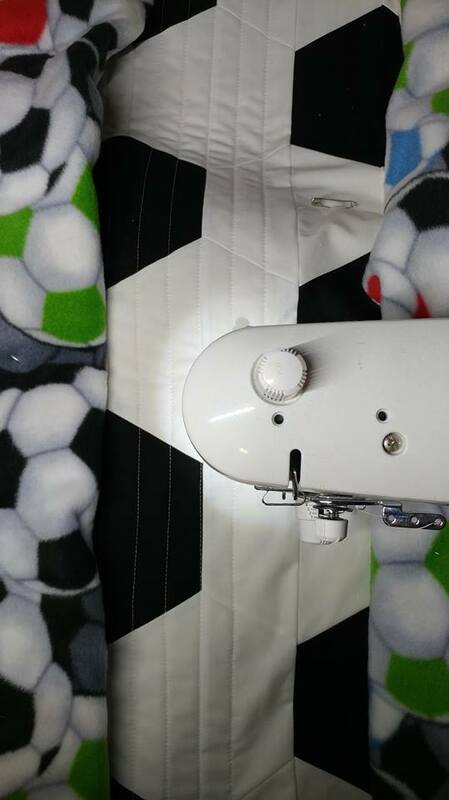 This made for much more precise seam joins between the rows. Once the top was done, I pin basted it on my dining room table with a colorful soccer fleece from Jo-Ann's and Warm & Natural batting. This was my first time using fleece for a quilt back! I figured since I have used minky with success for a few times now, that I'd try fleece. I loved it! 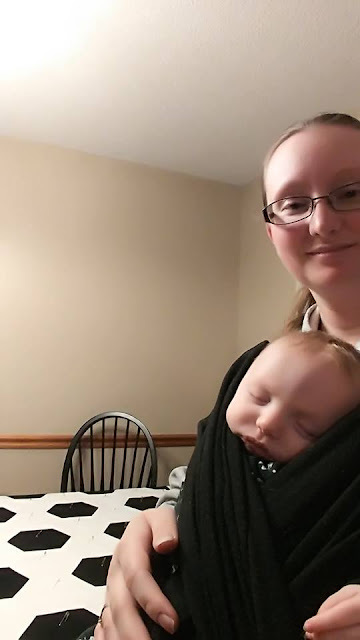 It worked even easier than the minky! I even had a cute helper for the basting party! He didn't think the party was that lively. 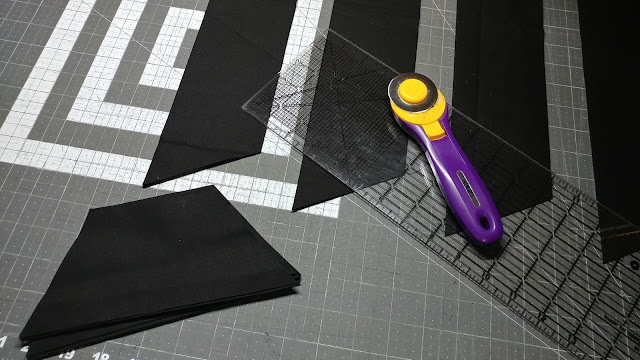 I decided to quilt horizontal straight lines using my walking foot. 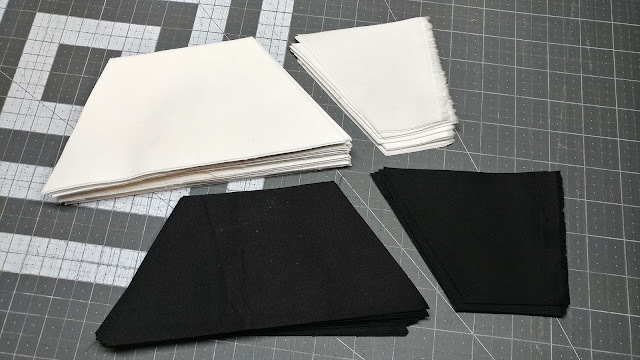 Since each row finished at 3" wide, I could quilt the lines 1" apart and use the row seams as a guide to keep all the lines as straight as possible. 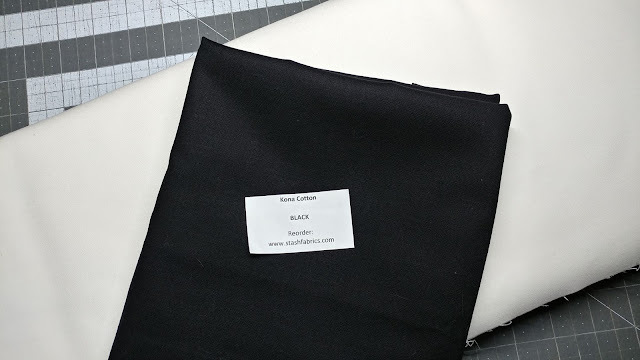 I'm not sure if you can see it in this picture, but there were lots of spots where the black fabric showed through the white fabric. Want to know what I did about it? Absolutely nothing!! This isn't a show quilt - it's meant to be used! I knew the recipient was not going to inspect the quilt that closely and complain about a few shadows! I had a few more helpers during the quilting stage. 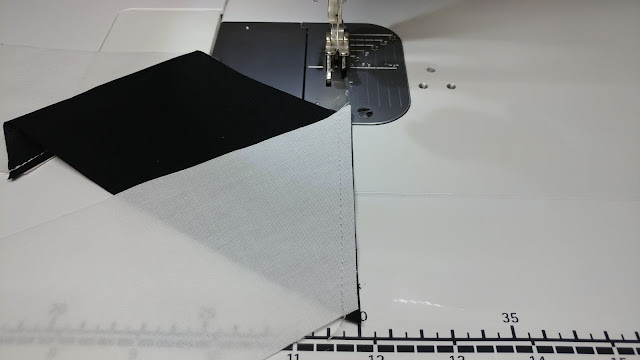 Of course I sewed the binding on by machine. 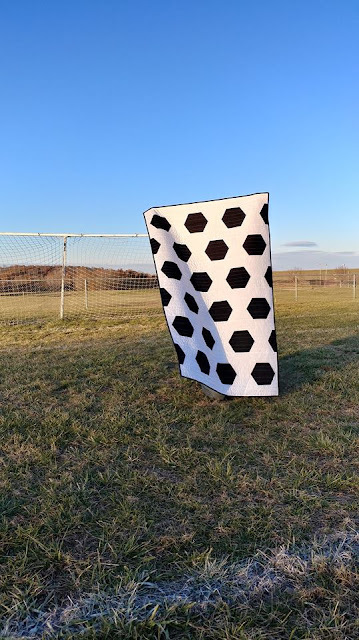 Then we took it out to the soccer fields for a few photos! 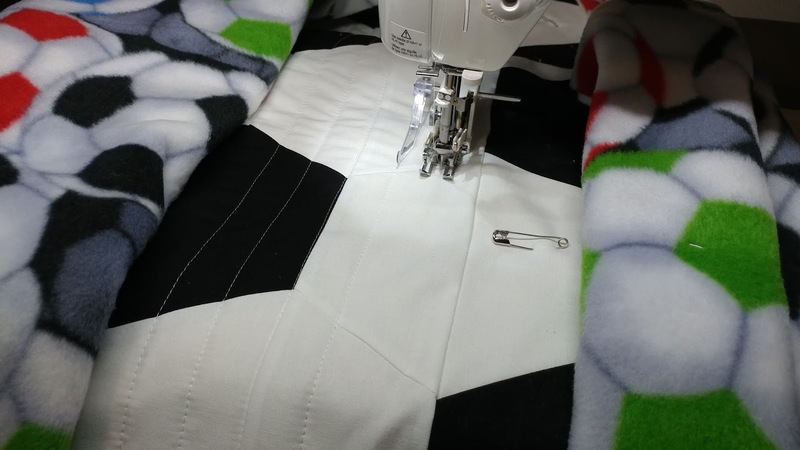 The combination of fleece and cotton batting gives the quilt a nice weight to it. 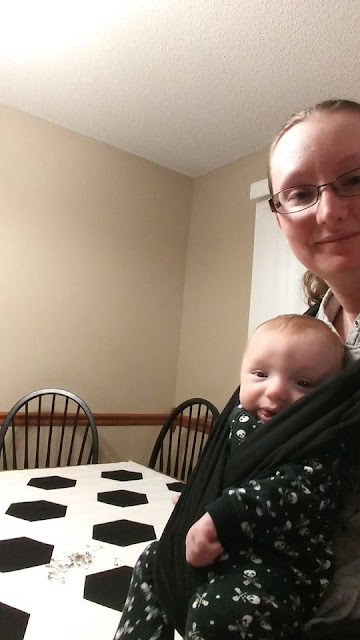 When carrying it out for pictures, I just wanted to wrap up in it! The finished quilt measured about 38" x 57". It's a bit longer than I would have normally made, but the length was required to get the hexagon pattern I wanted. Plus it's great to have a bit more length for a quilt for a man! My son gifted the quilt to his coach at the end-of-season pizza party this week. I hope the quilt is loved and used for many years to come! Now it's your turn! What have you been sewing lately? Link up your finishes for Thank Goodness It's Finished Friday (TGIFF)! 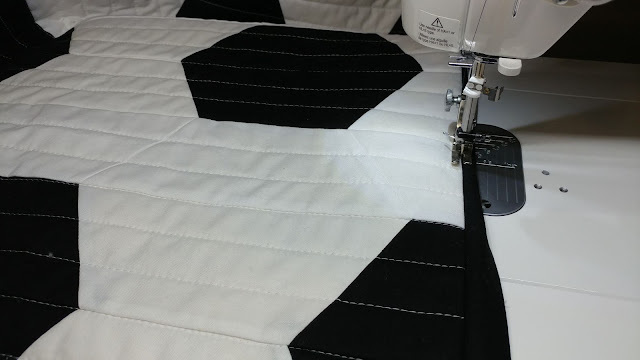 The fleece is the perfect backing and finish for the quilt! I think that nesting the seams was a good choice and that the shadowing threads won't be noticed at all. Congratulations on yet another awesome quilt. What an awesome quilt!! That is one lucky coach and he'll never forget you or your kids!! I can't imagine all the Y seams you would have been dealing with if you did the pentagon shape! What a wonderful job piecing those rows and then the whole top. The quilting works wonderfully and the back is so colorful. Your little guy must be a champ letting you pin like that. You get the award for awesome mom!! 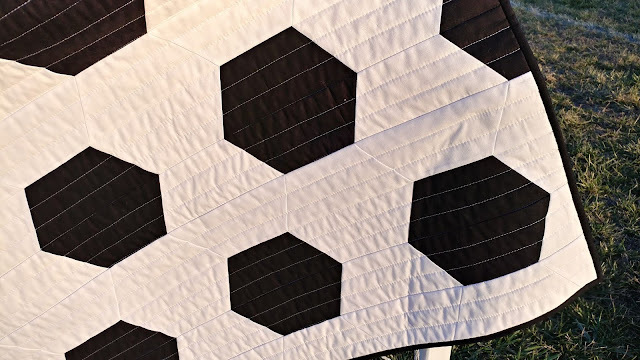 Impressive black and white hexagon quilt, and where did you find the backing!? What a fun quilt! I love it when inspiration hits and all the fabric is already in my stash! I think you scored a goal with this one (and your helpers are too cute)! 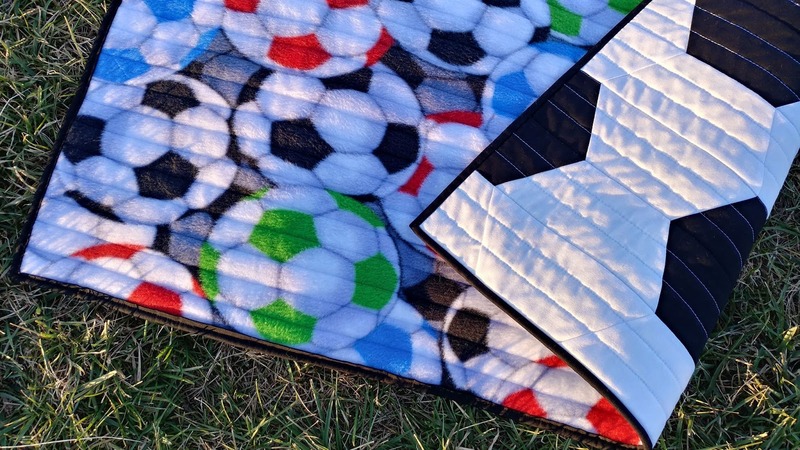 You hit the mark with this soccer quilt! 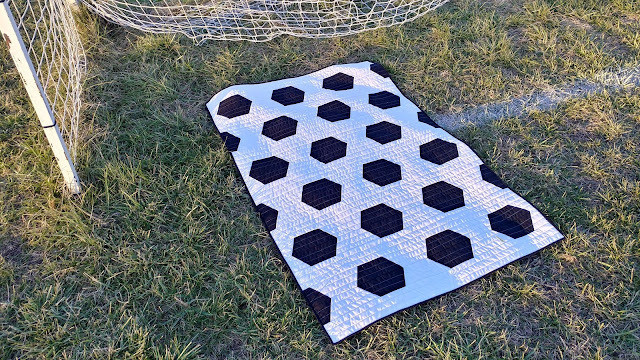 I love the black and white and your use hexies! It isn't easy hiding the shadowing created by dark colors, but your attitude is the absolute right way to go! 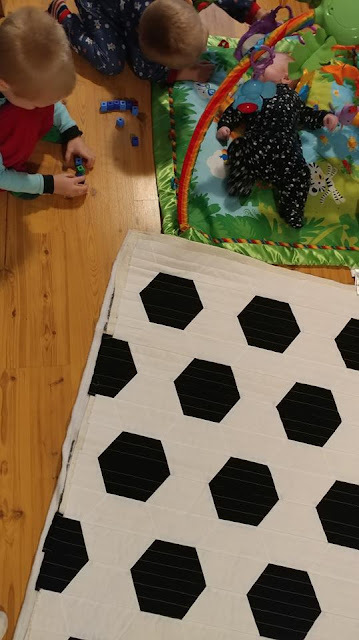 The hexagons were a great way to not have to sew circles. I've used minky but not fleece for backing. I'll have to give it a try. Amazing quilt, Laura! And sweet little pea in a pod!!! Two in one....got to be happy with that. I'm not sure what I like the most about this. 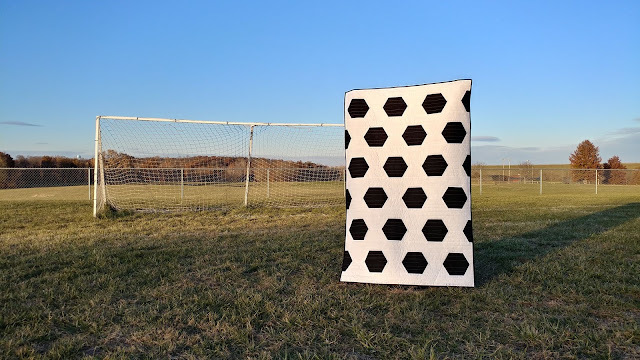 Very creative using the soccer ball fabric. This is so cute. And so is your helper.